The College Section of NCTE supports the exploration of English Studies in a variety of collegiate settings that include higher education institutions and early colleges. We are educators who teach English, composition, and literacy studies across the disciplines in colleges and universities, especially to undergraduate students. 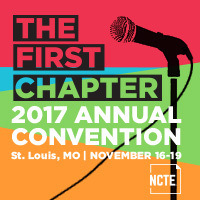 Explore the related college groups within NCTE. As teachers, researchers, and administrators, we often imagine our work with and about language as work that transforms people, ideas, classrooms, disciplines, communities, and even society. Many of us imagine our work with language as work that revolutionizes--work that changes ideas and people for the better--but how might our work be more than its product or outcome? CCCC/NCTE Studies in Writing & Rhetoric (SWR) series influences how writing gets taught at the college level. The methods of studies vary from the critical to historical to linguistic to ethnographic, and their authors draw on work in various fields that inform composition—including rhetoric, communication, education, discourse analysis, psychology, cultural studies, and literature. Not a subscriber of the college level journals? Subscribe Today! The NCTE Policy Analysis Initiative is a network of NCTE, CCCC, and TYCA volunteers who track state policy developments impacting English language arts, English studies, literacy, and the humanities. See what is happening in your state! This document was printed from http://www.ncte.org/college.